1. Click this link to add the gadget. After sign-up, it will take you to a page to add the Zemanta gadget to your blog. 2. 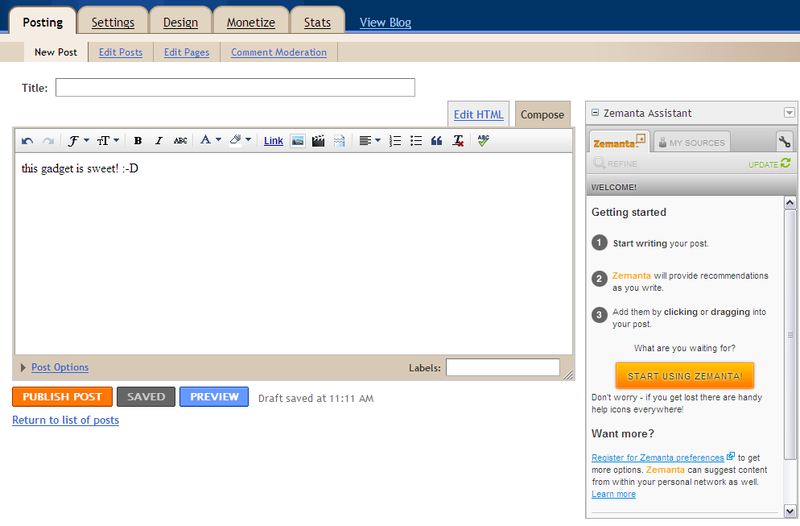 Select one of your blogs in the drop-down box, and click Add Zemanta. This will add the gadget to the post editor for your selected blog, and take you to a new post page. 3. You will see Zemanta is already turned on, waiting for you to start using it. That's it! You are now all set up to boost your blogging. Simply write a couple of sentences and the recommendations will show up automatically. You can preview them and then simply click on an item to add it to the post. To learn more about how best to use Zemanta, check out this video, browse through our tutorials, read about our selection as one of ReadWriteWeb's "Top 10 Semantic Web products" last year, or just get started and play around with it. We would love to hear your feedback or suggestions. * Notes: Adding Zemanta gadget will automatically update your blog's post editor to the New Editor; Also, this feature is currently available only for English-locale users.